For over 18 years, NetworkArts has created and conducted programs that engage children in the classroom, after school, and on the weekends. The non-profit organization’s educational focus guides children through uncharted territory by exposing them to new concepts and the opportunity to leave a lasting educational legacy for their communities through the art form of tile mosaics. Although NetworkArts offers educational programs in four main areas — science, humanities, intergenerational, and region-specific outreach programs such as those conducted every summer in Camden, NJ — its primary goal is to promote environmental responsibility. 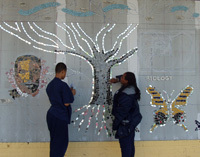 Through the resulting citywide body of colorful mosaics, now numbering over 50, NetworkArts brings the critical concept of environmental awareness to life. 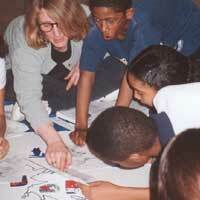 Each program includes an in-depth curriculum that literally transports children into the subject they are studying. For instance, students at the George Pepper Middle School in Southwest Philadelphia took a field trip to John Heinz National Wildlife Refuge at Tinicum, a 1,000-acre freshwater wetland less than a mile from the school. They researched the animals and plants found there and presented them as reports and drawings. They molded clay models of more than 240 birds known to migrate through Tinicum, explored the role of wetlands, learned how wetlands are disappearing and what they can do to advocate for wetlands preservation. All of this formed the foundation for the final masterpiece — a large, ornate mosaic created on the front facade of a previously drab school building. By touching the lives of many tens of thousands of children who have created over 200 mosaics in the Delaware Valley region and Northern Ireland, NetworkArts remains committed to expanding the horizons of children through education and art.